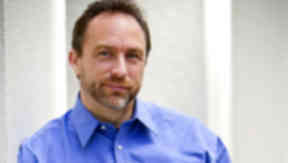 Jimmy Wales received an Honorary Degree of Doctor of Letters at Glasgow Caledonian University. Lane Hartwell on behalf of Wikimedia Foundation. The founder of Wikipedia, Jimmy Wales, was honoured at Glasgow Caledonian University on Wednesday. The American internet entrepreneur is one of the founders of the online non-profit encyclopedia known the world over as a key source of information. Since it was formed more than a decade ago, the online encyclopedia has grown to become one of the top five most visited websites. Mr Wales received an Honorary Degree of Doctor of Letters from Nobel Laureate and international anti-poverty campaigner, GCU Chancellor Professor Muhammad Yunus. After being recognised for his outstanding achievement within the field of internet entrepreneurship, John MacKay caught up with him to discuss the worldwide web and the importance of interconnection within the United Kingdom.